Kitchens have come a long way in the role they play in our daily lives. In the early days, the kitchen was located in the back of the house and played a major role only when it came to food or arranging a grand meal for the guests. Today, the kitchen plays a rightful role and has become an integral part of our homes and lives. Let's walk down the memory lane and discover how the kitchen has evolved from the humble beginnings to the heart of the home. In the Middle Ages, cooking was the only source of light and heat. All activity revolved around a central fire which was often placed in the middle of a large communal room. A significant problem for these communities was the vast swathes of smoke and soot produced by their constantly lit open fire. It was not until the 16th century that chimneys were widely adopted throughout households in Europe. So large were the chimneys that they effectively separated the room into two areas, one for cooking and one for the living. The kitchen as we know it today had begun to take shape. The economic and social changes that occurred across the 18th and 19th centuries meant the kitchen was now more in demand than ever before. The kitchens had completely shifted out of sight. They were either at the back of the house or even in the basement. For the wealthy, food was seen as a clear symbol of status and so servants were employed to create these lavish meals with countless courses, making it a hub of constant activity. This non-stop activity in the kitchen created a wide variety of employment. Even for the less wealthy, new technologies such as the cast iron stoves boosted productivity and efficiency in the kitchen. Despite the large numbers of servants required for cooking and cleaning, the rooms were often dark and cramped. In those days, any sounds or smells from the kitchen which permeated the rest of the house was a sign of poor hospitality. The concept of a ‘kitchen’ came about with a book by Catherine Beecher and her sister, Harriet Beecher Stowe. In 1869, the two sisters published a revised version of ‘The American Woman’s Home’. 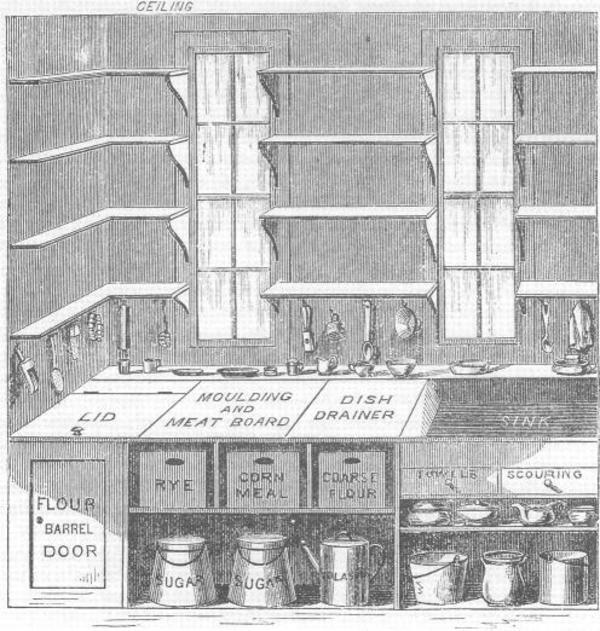 Among its many ideas were an initial layout for a kitchen as well as sketches of how various goods and ingredients could be stored in an efficient manner. 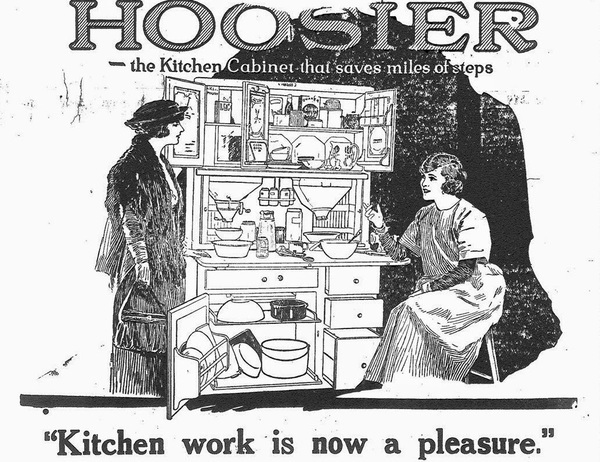 In 1899, the Hoosier Cabinet Company sprung up with the amazing idea of putting everything needed to cook into one standalone cabinet that could be set next to a stove and the sink. 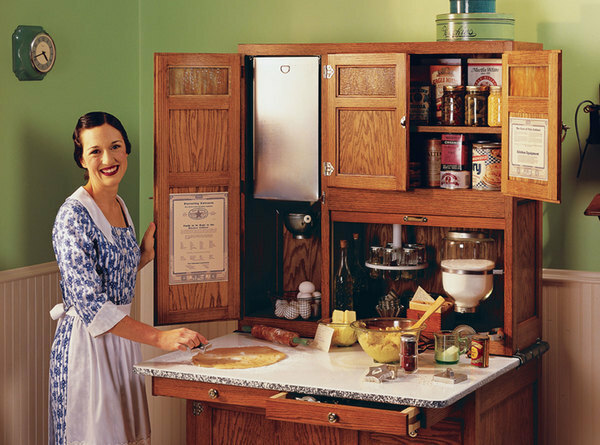 This space-saving unit known as Hoosier Cabinet. It was a more efficient kitchen design with its built-in features, extra storage, and additional work space. It was a powerful idea that got ahead of the cultural shift that moved cooking from a job to something that could be a pleasure. Rewind 100 years from 2018 and you will see that the kitchen was a utilitarian space, existing for food prep and little else. By 1900, nearly all houses had cooking stoves. Shelving is often open and freestanding cupboards are common. Many houses only have one heated room; and during the winter much of the house goes unused as people huddle near the kitchen stove. Fridges, as we know them today, are unheard of in 1900. People kept their food cool with the aid of the ice boxes, which came in all sizes and were made of everything from wood to metal. The first electric toaster went on the market in 1909. Before this, bread was toasted in a metal apparatus placed over an opening in the cook-stove. Unlike high-tech modern stoves with gas and electric ranges, hearths needed constant attention. Adjusting the stoves and dampers and adding fuel and water were just some of the chores these old-fashioned appliances needed. However, going into the 1910s, nearly every kitchen had the addition of heavy cast-iron stoves, sinks, and ice boxes. This was the decade that the basic forms of refrigerators, and waffle irons were coming into shape. In the 1920’s, ergonomic efficiency in the kitchen took one giant step forward with the creation of the tiny, but efficient, Frankfort Kitchen. 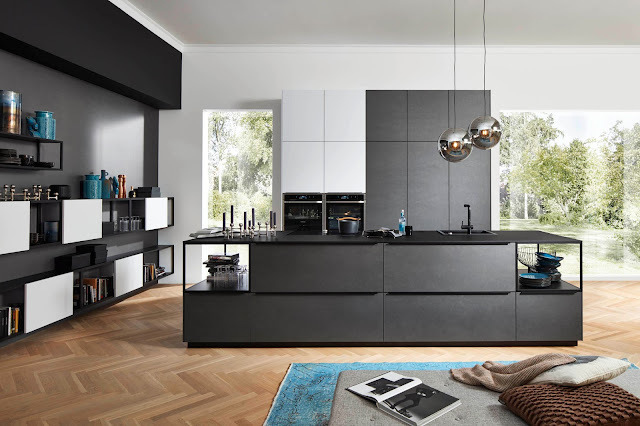 In Germany, in the year 1926, an Austrian architect Margaret Schutte-Lihotzky designed the Frankfurt Kitchen giving way to the modern kitchen. It was designed for architect Ernst May's social housing project New Frankfurt in Frankfurt. The kitchen was small and was designed like an assembly line, therefore, putting all necessary items in the kitchen within arm’s length. Although this sounds like standard practice for today’s kitchen, the idea of laying out the kitchen to make it more ergonomic and efficient for the homemaker was revolutionary, and eventually gave way to the “golden triangle” in which the cooker, fridge and sink are ideally placed for maximum efficiency. Though the kitchen was small, barely large enough for more than one person to work it became the standard for most 20th century homes. The 1920’s – 1930’s was a time of innovation, yet financial hardship for many people. 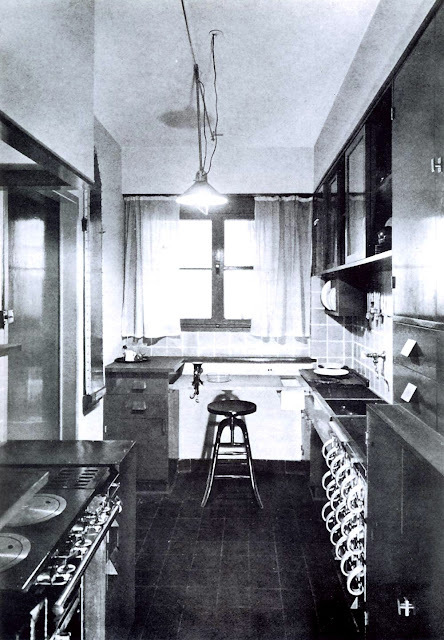 With the Great Depression at its height, the kitchen was a central hub for most families and the design was centred on practicality, functionality, and space saving. With the entrance of appliances into the homes of those who could afford these luxuries, kitchens started to take on a level of sophistication. 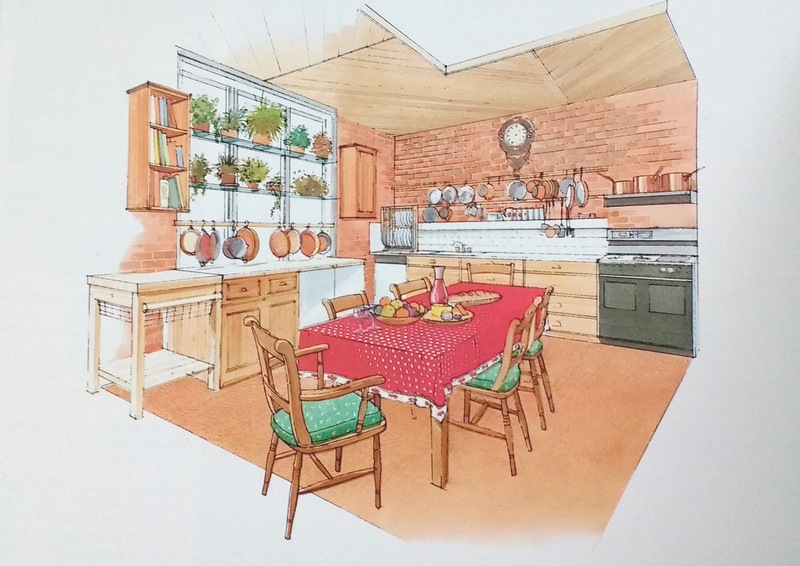 The gas stove, refrigerator, and icebox opened up a whole new world of storing and cooking food – the domestic kitchen was on the eve of a revolution. During the years of WW2, every spare cent went towards the global war effort and cost saving was paramount. A lot of wood was used. Cabinets were wood, floors were wood, countertops were wood and even your sink and tableware were often made from wood. Despite hardship on the home front, people began to add detail to their kitchens in the form of rugs, coloured cabinets, and linoleum floors. Bright colours such as apple green, pink, orange, and yellow added the much-needed cheer in the kitchen. While the designs were plain and simple, usually focused on functionality over fashion. Electric appliances also became more common. Slowly the concept of fitted kitchens came in, whereby all technological wonders started taking centre stage. This kitchen designed around technology helped increase efficiency and reduce time consumption. In the late 1930s, the Usonian homes designed by Frank Lloyd Wright introduced the concept of free and open layouts. The Usonian brought the kitchen from the back of the house and adjoined it with the home’s main dining space. These spaces, in turn, flowed into the main living areas, putting in place the necessary elements needed to evolve and eventually open up the kitchen to the home completely. In this design, the kitchen was slowly incorporated into the design of the living areas forming virtually one uninterrupted space. After WWII ended, the people began to invest in modern appliances like refrigerators and gas-powered stoves. People began to forego stand-alone furniture and appliances, instead opted for built-in fixtures. The integrated kitchens dramatically altered the look and feel of the space. The fitted kitchen introduced inbuilt cabinetry and appliances which helped create a more purposeful, and beautiful interior design, and the workflow within the space became easier to use. This trend gained quick popularity. The 1940s was a period where the emphasis was on aesthetics. Kitchens become even more decorative as people begin to display plants and chinaware outside the cabinets. Homeowners became more demanding; matching appliances, utensils and cabinetry were common requests. In short, kitchens were now a room that the homeowners wanted to be proud of. 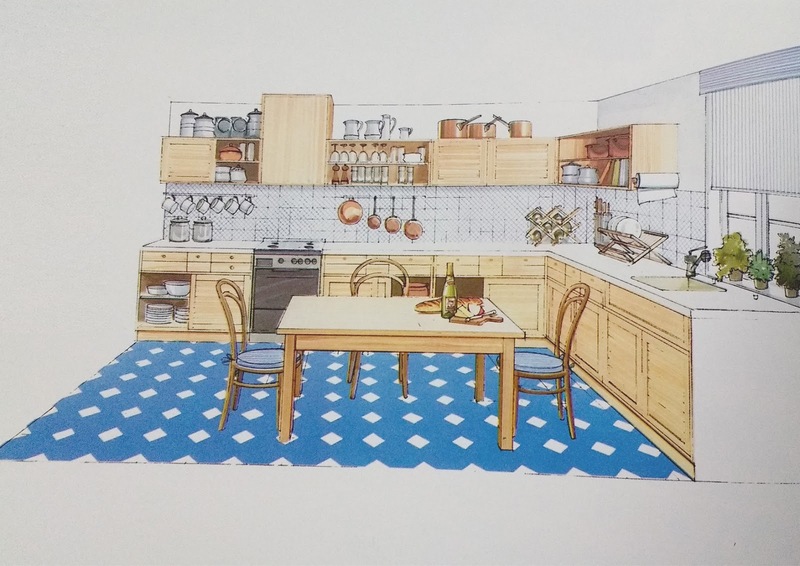 Fast forward to the 1950s, which was the start of a new era — kitchens were getting fancier, with homeowners focusing more on design, rather than simple functionality. During this decade, everything from kitchen appliances to wallpaper was bursting with colour. 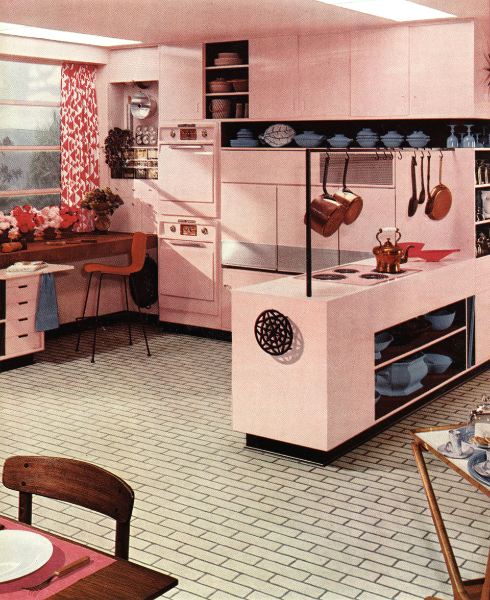 The 50's officially said goodbye to the all-white kitchens and said hello to colours of blue, green, pink, and yellow. Patterns of flowers and bold designs were also extremely common for wallpapers. What’s more, the kitchen now began to be connected to the living room, making the dark and dreary design and location of the kitchen a thing of the past. Advancements in refrigerators and electric stoves made these appliances a common sight in nearly every home. The emergence of toaster ovens, handheld mixers, and stand mixers proved to be popular too, as they added convenience and ease to baking and cooking. Kitchen style becomes even more daring as light pink, mint green, and blue appliances are introduced along with floral wallpaper. Refrigerators equipped with ice makers are introduced. People began to move beyond functionality and try to make their kitchens look nicer. Decorative touches, like the use of bold colours and pastels as well as floral-patterned wallpaper, were often used. U-shaped kitchens became more common, as well as kitchen islands.